The Maileg Chatons Kittens are French sisters that always get along and into mischief! They love their hand knitted angora blend sweaters and floral skirts. 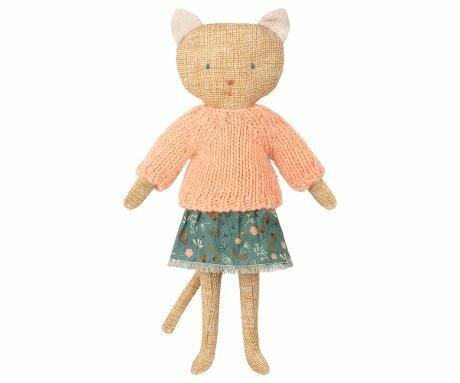 This kitty loves her soft yellow sweater and light floral skirt. Add a knitted hat to complete their look. 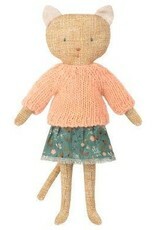 She is about 10 inches tall and made of cotton, linen, polyester filling and angora blend removable sweater. Cotton skirt is also removable. Can fit mini furniture.